In commemoration of Total Defence Day, I thought I could try to ask four fundamental questions – and address some common doubts – about defending Singapore: (1) Do we need to defend Singapore? ; (2) Do we need our own military force to defend Singapore? ; (3) Do we need to invest money, talent, and effort into our military? and (4) Is military defence sufficient? Firstly, let me tell you a little bit about myself, to put my thoughts in context. I was not born here. I was born in India, in 1979. My family moved around a lot, as a result of my father’s business ventures. We moved to Nigeria from 1980 to 1983. I heard gunfire for the first time as a child, outside my house at night; I do not remember much about that time, but I remember the noise and the fear. In 1983, there was a military coup in Nigeria. My family moved back to India and we lived there in 1984. Indhira Gandhi, the Hindu Prime Minister, was assasinated in 1984 by her Sikh bodyguards. There were religious riots and civil unrest across India. I remember that vaguely too. We moved again, to West Germany. West Germany no longer exists today, because in 1989, the Berlin Wall came down and it merged with East Germany, which had been isolated from globalisation and I think their people might have been shocked to see dark-skinned people like my family. We moved again, this time to Singapore, when I was 10. I decided that I was done moving around; that this would be home. I opted to go to a local school, and told my parents I wanted to do National Service eventually. I studied at Raffles Institution and remember my time there very fondly because it was where I really came alive. While I played many sports, my time as a debater shaped me the most. It taught me how to question everything, to see both sides of an issue, and most importantly, to disagree without being disrespectful. I like to tackle controversial issues head-on. I think it is pretty obvious why I joined the military eventually. I have an appreciation for security and peace unlike most other people my age. There are many interesting details along the way, but the only point I would like you to take away is that we are all very lucky. We are blessed to have a peaceful and safe country to live in. I worry that we may not always be so lucky; the danger of a few fundamentalist madmen or cyber-terrorists attacking us keeps me awake at night. Do you honestly believe we will never be targeted for the next decade? I do worry. (1) Do We Need to Defend Singapore? There are three ways to interpret this question: the first is that Singapore may not need to be defended at all, because it is not worth defending and we do not love it here. I have read angry posts and comments about how much that person hates a policy, or hates a politician, or hates living next to a columbarium, and they proclaim on the internet that they hate it here and want to migrate. Singapore is not perfect, I agree. There are policies that I wish could be better. Having lived, studied, and worked around the world, I know that no country is perfect. But perfection should not be the measure of love. Singapore is home to our friends, our families, our memories. That is worth loving, and that is worth defending. The second is that Singapore does not need to defend itself; we can rely on the global supercops to swoop in and help us. Let me tell you what happened in Ukraine. In 1994, they signed the Budapest Memorandum on Security Assurances before giving up their nuclear arsenal. This document stated that Russia, USA, and UK would step in to protect Ukraine if they were ever threatened. We all know what happened in 2014: Russia violated the terms and effectively annexed Crimea; USA and UK both reneged on their signed commitment to defend Ukraine against any threats. So if you think we can just become a treaty ally with USA and rely on them for our defence, I think that may not be wise. Just because your condominium has a security guard downstairs does not mean that you can leave your door unlocked when you go out. We should always take responsibility for our own defence, even if there are others who claim they can help us in the task. The third way is that Singapore and the region is so peaceful, there is no need to be worried about an attack. Let me ask you a trick question: are you healthy today because you take health supplements, or would you be healthy even if stopped taking them? And it is too late if you wait until you fall very sick to start taking vitamins. You have to take Vitamins while you are healthy, not when you fall sick. We have that same paradox for the defence of Singapore. We need to build a strong military while we are peaceful, not after the region becomes turbulent. It is too late to wait until then because, like Vitamins, military buildup and training takes a long time to have any effect. This brings me to the second question. (2) Do We Need a Military Force to Defend Singapore? Yes, I think we do. I could cite cases where countries in our neighborhood have acted in unfriendly ways towards us, by naming their warships after people who killed Singaporeans, or by holding huge military exercises on our national day to try and scare us. We need a good deterrent to prevent countries – whether in our neighborhood or from far away – trying to bully us in more serious ways. 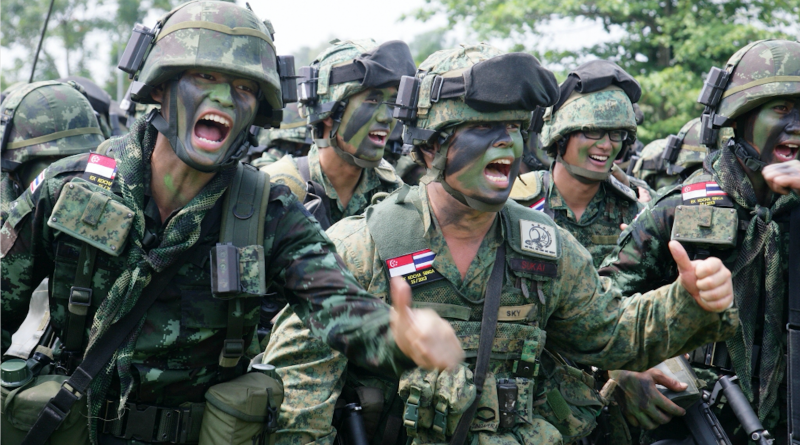 The SAF enables Singapore to remain an independent and sovereign nation. Those are very abstract concepts to most people, until you have lived through what I have been through in those other countries. As teenagers, I’m sure most of you value your independence: you want to be treated and respected as a mature thinking human being. As a country, we want others to treat us the same way, and the SAF gives Singapore that weight. We also need the SAF to prevent conflicts in the region from spilling over into our back yards. If you have been reading the news, you know that the South China Sea is a tricky area. We have no claims there, but we live just next door. If things get dangerous in that neighbourhood, we do not want people walking through our house to get to their destination. The SAF secures a peaceful future that allows our economy to grow and prosper. When I was in the Ministry of Trade & Industry, I worked hard to convince Rolls Royce to move a huge chunk of their industry to Singapore. In the middle of the 2008 recession, they agreed to anchor roots here for the next few decades! One of the reasons they felt comfortable making such a huge investment was because they were confident that we would be able to guarantee security in the longer term. That is not an easy guarantee to provide. The SAF enables our way of life. As last year’s total defence theme states: the SAF gives strength to our nation. Our strength comes from our people and the effort that we have put into building it. Which brings me to the third question. (3) Do We Need to Invest Money, Talent, and Effort Into Our Military? A military force costs money and needs a lot of good people. I have read petitions asking for the Government to spend less on defence and more on social causes like education and health care. I think it is a valuable debate to have, and it is not an easy dilemma to resolve. Let me share my personal thoughts. First, on Money. Singapore needs to defend itself, but given how small we are as a country, that is not easy to do. The military logic is quite complex, but I will give you the summary: it is harder to defend a small country because we cannot retreat inland to buy time, and holding a long defensive campaign is very hard. So money buys what we lack in size. We buy long-range fighters and train them against the best air forces in the world, so that we can show everybody that we can take the fight to the enemy and win. We cannot rely on outdated military technology because we are smaller; we need to be better in order for the deterrent to be of any value. Nobody is deterred by rusty broken fighters. Next on manpower. I think it is possible that we could win a war with an all-regular small military force instead of the current large conscription-dependent force. That is my personal opinion. However, our goal is actually to avoid war. We are trying to build a deterrent force. And in that sense, a small military is not as good a deterrent as a large military. NS is a means to an end. It shows the world that we as a people have the will to defend ourselves, in addition to having the right military equipment. That is a powerful message. The question of the length of NS is tricky. I wish it were easier to download all the skills and knowledge of military operations into an 18-year old’s brain instantly. Unfortunately, it takes time to train a person into a soldier that can be part of a deterrent force. The SAF has already implemented better training and e-learning to reduce the training time, and is looking into other ways to improve NS. Is the duration of NS forever cast in stone? No; we reduced the duration a decade ago and may well do so again in future. Thirdly, on Talent. As you can guess, I was a recipient of the SAF Overseas Scholarship. What you may not know is that I made a number of choices which baffled many. I did NS, which – if you remember my story – I was a foreigner and thus could have skipped NS if I did not want to sign up for PR and citizenship. I could have gone straight to university. But I felt that that would be wrong. I wanted to call Singapore home, and thus I knew I had to live up to the obligations expected of all other males who call it home. So I did NS. Then I was offered a PSC OMS Open scholarship. And I requested instead to be considered for the SAF Overseas Scholarship. That also baffled many. Not only was I mad enough to do NS, I was mad enough to want to do military stuff for the rest of my life. I’m sure the psychologists had a lot to write in my assessment report about that. I told you my story, so you understand why I feel that peace and security are so important to me on a personal level. I wanted to contribute to that. Why do smart people continue to join the military? There is a saying in diplomatic circles: speak softly and carry a big stick. I am sure that our SAF scholars do not go to the best universities in the world to end up just being big sticks. The military gives the country something that we call “policy space”. We are a force designed to defeat an agggressor. But because we have very smart people who know how to be nimble, when a huge tsunami hit Aceh and Phuket in 2004, they were able to convert our military might into a humanitarian force. We understood that in the grand scheme of things, we need to be responsible neighbours. When they need our help, we need to offer what we can. I was one of the first helicopter pilots there, and I spent many many weeks flying relief missions. It is not easy to re-organise a fighting force overnight to do those tasks, but with the collective brainpower of many good men and women, we were able to do it. Smart people keep Singapore’s deterrence effective while building relationships and creating policy space for us as a country. This is a delicate balance, and requires tact and firmness to be both deterrent and diplomatic at the same time. (4) Is Military Defence Sufficient? No. It is necessary, but it is not sufficient. I know that sounds like an Economics essay answer, but it’s true. The entire point of Total Defence day is that military defence is not enough. The other four pillars are civil, economic, social, and psychological defence. Why is all that important? Can’t we outsource the job of peace keeping to soldiers and leave them to it? I want to emphasise Psychological defence, which loops us back to the first question I asked: will you defend Singapore, intellectually? Will you care enough to want to be part of the solution, by using your blessings of brains and leadership, to do something productive? And if you feel that your calling is elsewhere, will you still care enough to step in once in a while to debate the contentious issues in a respectful and robust way, or will you add to the cacophony of angry blogs out there? Patriotism to me is not blindly waving our flag or yelling the pledge from the rooftops. Patriotism means believing that we can be better. It means believing that Singapore is worth defending, intellectually, emotionally, and physically if required. It means believing that all of us are the hope for a better age. Colonel Gaurav Keerthi is an air force pilot with the RSAF. Outside work, he was the former President of the Debate Association (Singapore) and remains an active volunteer. He has written a best-selling book, co-created and hosted an Emmy-nominated TV debate show, and is the founder of www.dialectic.sg, a unique commenting platform for more respectful online conversations. This op-ed was adapted from a speech delivered by Gaurav at Raffles Institution in 2015 to commemorate Total Defence Day. Featured photo from www.defencetalk.com.